From our Unique Beaded Fringe Collection (trims under 1 1/2" long)This trim sparkles in translucent aurora boris faceted teardrop beads. It is available in 5 different colorways. This is a high quality, very full beaded fringe with exceptional detail and craftsmanship. The longest beaded stands are 1 " long, not including the 3/8 " light brown cotton ribbon. 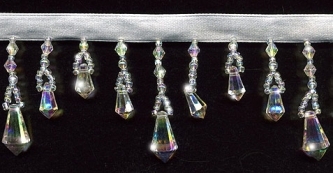 You will love the way these beads sparkle in the light! Exquisite! Perfect for apparel or home decor.